With the exceptions of geothermal and tidal energy, renewable energy emanates from our sun. The suns energy can be harnessed directly as heat by solar thermal devices to raise the temperature of air or water. It can be trapped chemically by plants and organisms through photosynthesis. Note it is the energy trapped by ancient photosynthesis we currently reply on and release when we burn fossil fuels. 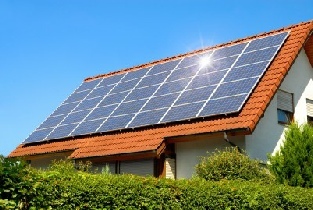 Modern science has developed the photovoltaic cell which produces electricity directly from the suns radiation. Solar energy also acts on the earth’s surface, evaporating water which then falls as rain to power the generators in hydroelectric dams. The suns energy also differentially heats the earth atmosphere. At the equator the heating is most intense, less so at the poles. In addition as the earth spins, night follows day and different parts of the atmosphere are successively heated and cooled. Hot air is less dense than cold, so rises allowing colder heavier air from the poles to slide beneath. These movements of air form complex ever changing global convection currents in our atmosphere which we refer to simply as wind. Air has mass and weighs 1.2kg per cubic metre at sea level. A body of moving air therefore contains kinetic energy. This energy in wind can be harnessed directly. Man has used its power to propel boats and ships for thousands of years. Panemones are the earliest wind powered machines developed for grinding grain and have been dated back 3,000 years! Today’s commercial Wind Turbines can convert up to 40% of the energy present in a wind stream into electricity. Unprecedented efficiency when you consider a typical heat engine as in a car or power station will convert less than 30% of the fuels energy to useful work! The wind also acts on the surface of the world oceans rippling its surface into waves. 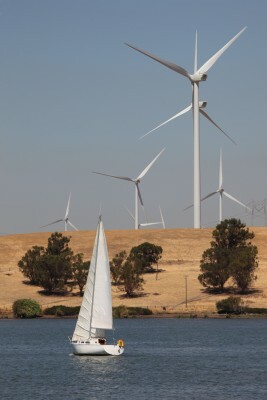 Water is a much denser medium than air and therefore waves can be thought of a concentrated form of wind energy. Despite much encouraging pioneering work harnessing wave energy on a commercial scale remains off an early stage. Tidal energy also holds great promise. As water is heavy i.e. 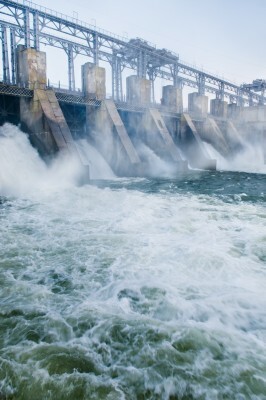 800 times denser than air, large amounts of energy can be extracted from bodies of moving water. The effect of the moon’s gravitational pull on the world’s oceans, piles water up where the attraction is strongest at the point on earth nearest to the moon. As the earth spins and the moon orbits, the world’s oceans are pulled about ebbing and flowing to produce tidal streams. These streams can be harnessed by trapping sea water behind large dams as in the proposed tidal barrage scheme across the Severn Estuary. Alternatively tidal flows can be harnessed directly using devices which operate in a way analogous to submerged wind turbines as water weighs over a 1000kg per cubic metre, tidal flows contain a lot of kinetic energy. The UK is particularly fortunate in having some of the best renewable energy resource in the world. Also historically UK scientists and engineers have been at the fore front of the development of technologies to exploit these resources. Unfortunately their industry and vision has not been matched by successive UK governments, and the UK now finds itself importing commercial renewable technology hardware and expertise.